The 2014 holiday season is here! It's time for bundling up in winter coats, drinking hot chocolate, singing carols, spending time indoors with friends and family and sharing and exchanging gifts. Sharing recipes for homemade gifts to give to family and friends for the holidays is a fun, economical way to show you care. Gifts From the Kitchen is this week's Sunday Supper theme and Renee from Magnolia Days is this week's gracious host. This week I'm sharing a gift that's near and dear to me. 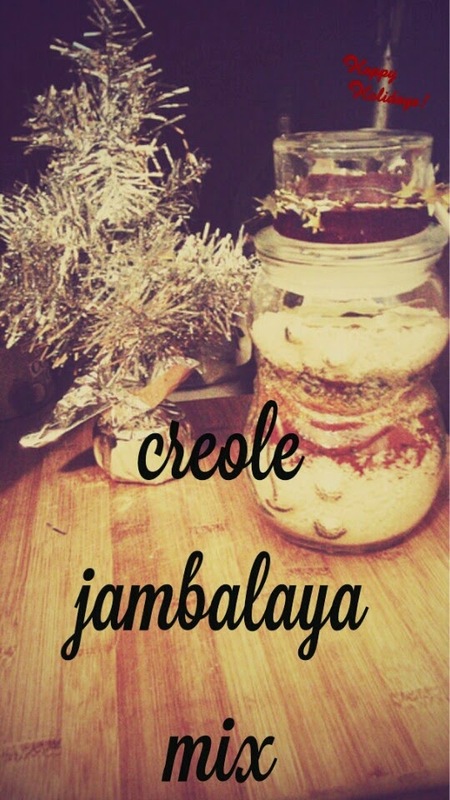 A Creole Jambalaya Mix. I am a grandchild of New Orleans. My grandfather was born, raised there and came to North Carolina in the 1950s to attend college. To make a long story short, recipes and traditions from New Orleans have been passed down to me and it's my job to share them with you. Jambalaya is one of five dishes that my my mom taught me (she's not the best cook in the world) and this version that I'm sharing with you is a pared-down, yet still flavorful recipe that can feed an army. Usually, fresh onions, bell peppers and celery would be cooked down and added to rice with tomatoes. In this "gift" version, everything is dried, but the flavors are still there. 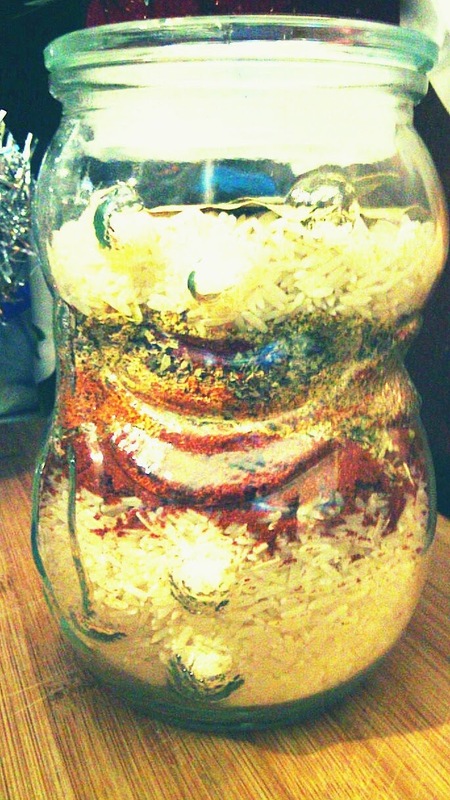 I layered mine in this novelty jar shaped like a snowman, but generally a quart-sized glass jar will do. Also, I love the colors of the different layers, but that isn't necessary. Everything goes into the pot at the same time, so if you mixed it up, you'd probably fare better! Brown chicken and sliced smoked sausage together in a skillet on medium-high heat. In the same pot, add chili sauce, the entire Creole Jambalaya Mix jar and deglaze the pan with 8 oz of chicken stock, scraping the bottom of the pan to mix up any browned bits, and stir until smooth, making sure the seasonings and rice are incorporated and mixed thoroughly. Add the can of tomatoes and salt to taste. Cook over medium heat for about 10 minutes. Add the remaining stock and stir. Season to taste. Cook for about 20-25 minutes, or until the rice has absorbed all the liquid and is cooked through. Reduce heat to low-medium. Uncover pot and stir frequently for an additional 10 minutes. Don't forget to check out all of the other gift ideas from the rest of the Sunday Supper Crew! What a nice gift to give! Jambalaya in a jar (mostly). It's a gift I would certainly love to receive. This is such a thoughtful and delicious gift. I just love it! I love jambalaya! This would make a fantastic gift to give! I've never thought of creating an entree in a jar! What a fun gift idea...and a nice break from all the sweets. Plus, who doesn't love jambalaya??? I am so, so obsessed with this! As soon as I saw it on Facebook, I couldn't wait to see the recipe. Maybe I'll make some and give it as a gift but really, I'll be whipping up a giant batch for myself! Homemade gifts are the best! Love this idea. I would be doing a happy dance if someone gave this to me over the holidays. What a great idea! Now there's a fun idea! Love this! Wow! I've seen homemade cocoa mix and cookies to give as gifts but I've never seen anything like this, Awesome! What a fantastic and thoughtful homemade-from-the-kitchen gift! Love it! I love finding new edible gift ideas!! This is such a fun idea - I love that those classic flavors are packed into a dry mix. I'm thinking a bunch of my family members ar going to be getting one of these jars this Christmas! I love gifts from the kitchen and that you have roots in New Orleans. What a fantastic mix and the recipe is amazing! I love this idea! Sure does beat a jar of cookies!!! This is a very creative gift that I would love to receive. This is such an awesome idea! I always buy the boxed jambalaya mix... I never thought to make my own. This is absolutely amazing. New Orleans is on my bucket list, I am dying to go there. Mostly for the food.